“Great companies obsess over productivity, not efficiency,” Michael Mankins wrote for Harvard Business Review (HBR) in March 2017. Mankins is a Brain & Company leader and partner, as well as a coauthor of Time, Talent, Energy: Overcome Organizational Drag and Unleash Your Team’s Productive Power. Organisational drag is any process that consumes valuable time and prevents people from getting things done – ie: productivity killers. The best companies are the ones that identify issues getting in the way of productivity and either create more efficient processes or remov them altogether. The same thing applies to individual staff members, entrepreneurs, freelancers and anyone who cares about making the most of every minute and [insert currency] they spend. Whether you’re working solo or as part of a team, you need the right tools to identify and overcome productivity – so, in this article, we’ve got 10 of the best time management and productivity apps to help you get more done. In this article, I’m going to run you through my pick of the top 10 time management and productivity apps that will help you get more done every hour of the working day. Productivity tools come in many different forms and they often take a different approach to improving your workflow. So I’m not just going to reel off ten apps and make out all your problems are solved. All of these apps approach productivity in a different way, solving different types of problems. Most of them are great for individuals while teams are probably going to want to choose a different combination of tools. So, once I’ve introduced each of these apps, I’m going to spend the second half of this article comparing them to help you choose the right toolkit for your needs. Note, these aren’t in any particular order. All of these apps are great at what they do and my aim here is to help you get a better understanding of what they do differently and what you need from productivity tools in general. Here’s the first app I want to show you today. 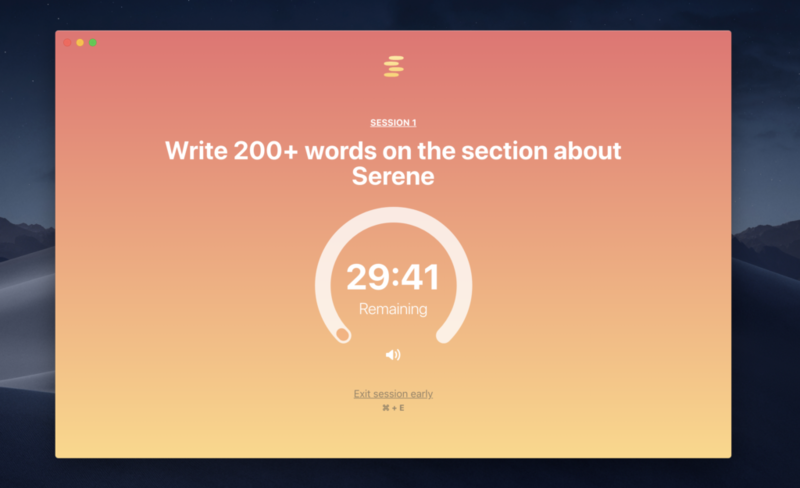 Serene is a free MacOS application designed to shield you from distractions and focus your day around one goal that matters. Currently in private beta, you must request an invite to try it out. So, how does Serene work? The idea is that each day you set the one goal that is most important for you to accomplish, and then break your day into small distraction-free sessions (normally 20-60 minutes each) that enable you to complete your one most important goal. 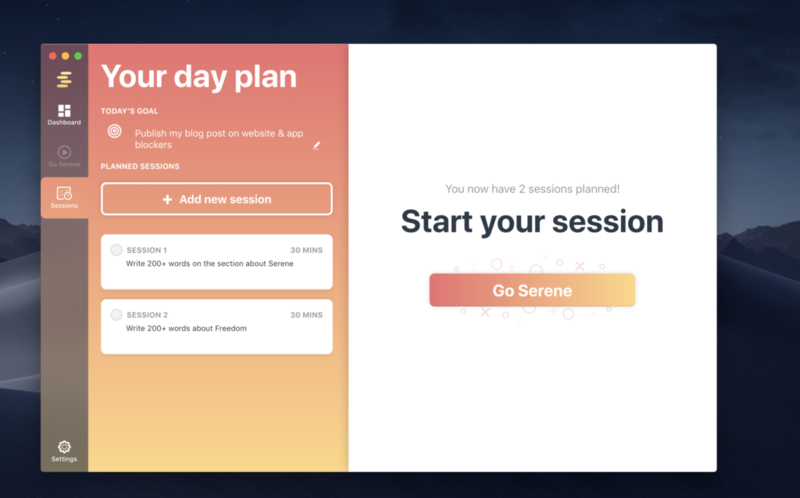 When you Go Serene (start your session), Serene blocks any distracting apps you define like Slack or Skype from opening while you’re in your Serene session. You’ll also see a countdown timer and, optionally, can play soothing focus music while you work. 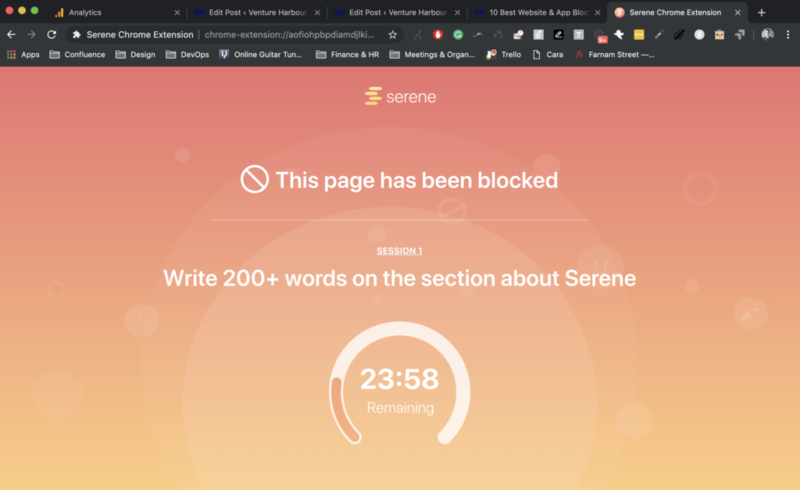 Finally, Serene offers a browser extension that also blocks any distracting websites that you define when you’re in a session and instead reminds you of what you should be working on. 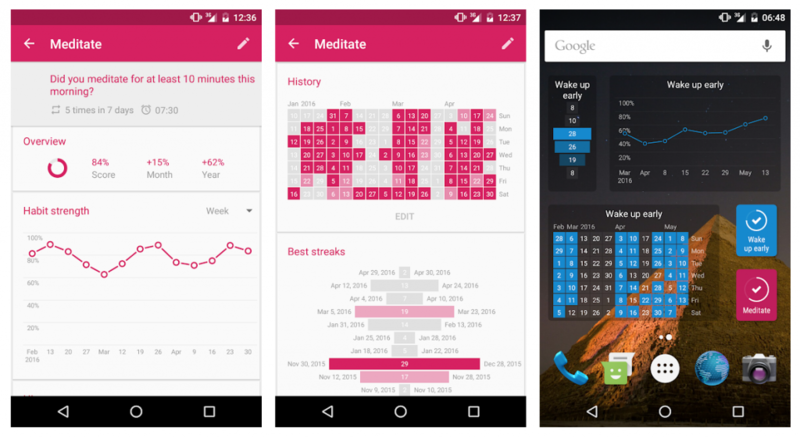 As mentioned, Serene is a relatively new app and is still in beta. You can request an invitation to try it out here. RescueTime is a productivity app that runs securely in the background of your computer or mobile device, tracking the time you spend on different applications and websites. The app then compiles reports of what you’re really doing with your time. The idea is to spot apps and sites that you’re wasting time on and then block them to become more productive. Activity tracking: See how much time you’re spending in apps/on websites to measure productivity. Website and app blocking: Block out the apps and website stealing your attention so you can get more done. Goals: Set productivity targets and use RescueTime’s reporting to see how well you’re doing. Alarms: Set alarms to warn you once you’ve spent more than your allotted time using an app/site. If you’re spending too much time on social media or catching up on the news in the morning is taking valuable time away from your working day, RescueTime is one app you definitely want to look at. Take a look at our list of top 10 website and app blockers for some of the best alternatives to RescueTime. 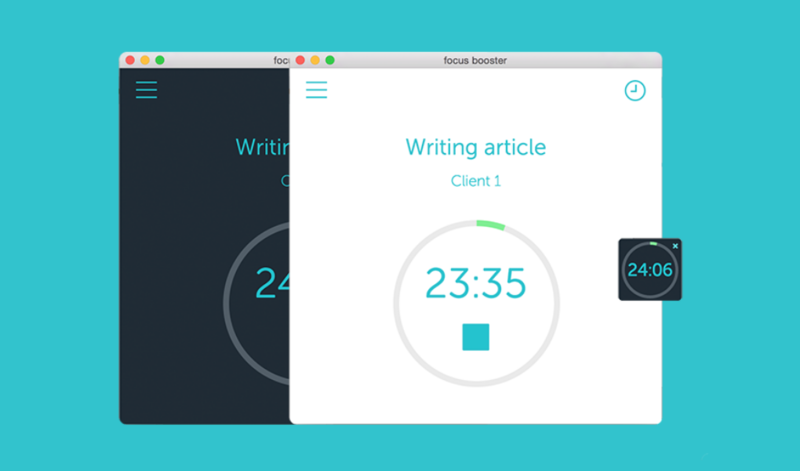 focus booster is “designed to make you do more” with a cross-platform app built around the Pomodoro Technique – a popular time management concept. The idea is to work in sessions of 25 minutes and then take a five-minute break. The key thing is to stay focused for those 25 minutes and then give your ind the break it needs before getting back to work. This is the principle behind focus booster, which times your pomodoro sessions and helps you get into the habit of being more productive. Session times: Work for timed 25-minute sessions and five-minute breaks. Mini timer: A miny timer on screen helps you stay on track. Save sessions: Save sessions when you get unavoidable distractions. Timesheets: Instant and manual times to log your progress. Reports: See where you spent your time and look for any distractions holding you back. If you don’t want to go as far as blocking apps and websites but you need a gentle nudge into a more productive workflow, focus booster is an interesting option. Toggl is a simple time tracker with powerful reporting that keeps track of how much time you’re spending on tasks. That’s pretty much it but the idea is to help you create a more profitable business, knowing you’re charging for all the time spent on projects – or not spending more time than you’ve quoted for. For teams, it’s also a great tool for comparing the amount of time people spend on tasks, finding out what individuals are best at and knowing who can get you things done under pressure. Time tracking: See how much time you (or others) are taking to get things done. Boost profits: Check you’re charging enough for the time it takes to complete projects. 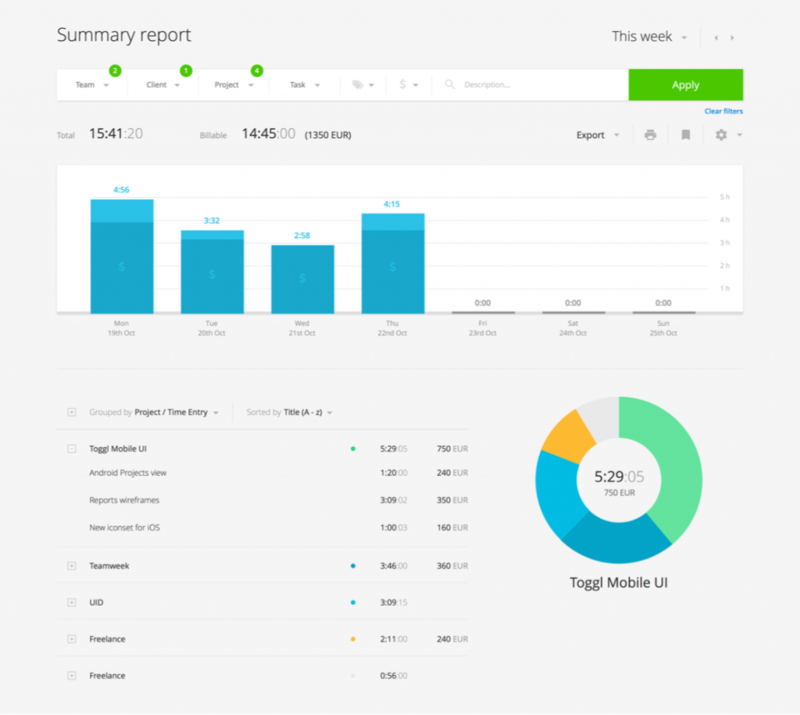 Reports: See how productive you’re being and how profitable your time with Toggl reports. Cross-platform: Toggl’s wonderfully designed apps work across just about every operating system and online so you can access it wherever you need, whenever you need it. Toggl is an incredibly simple app but it does what it’s designed to do perfectly. Sometimes more features simply create more distractions and that’s counteractive for a productivity app – s problem you definitely won’t get with Toggl. Be Focused is a minimal productivity app for Mac and iOS that also takes heavy influence from the Pomodoro Technique. If you read our description of focus booster earlier in this article, you have a good idea of what you expect. Be Focused will have you working in short bursts of productive 25-minute sessions and then taking a short break. Except, Be Focused is more liberal than focus booster’s app, giving you full customisation over the duration of your sessions and breaks. Manage tasks: Set timed work sessions and breaks for tasks. Goal tracking: See how well you’re doing at hitting targets. 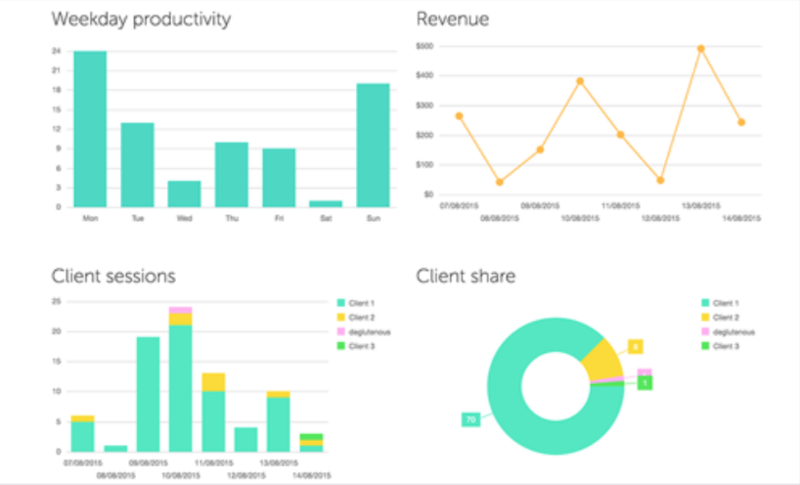 Reports: See how productive your days, weeks and months are with Be Focused reports. If you’re an Apple-only user, Be Focused offers a lot of productivity tool for a modest one-time payment. This time we’ve got an Android-only productivity app but Loop takes a very different approach to most tools you’ll come across in this category. Instead of trying to keep you away from bad habits getting in the way of work and life, Loop aims to help you spend more of your time forming beneficial habits. it could be spending more time on neglected admin tasks, catching up on your ever-growing inbox of emails or spending more time with the kids when you’re not working. Whatever you want to be doing more of, Focus will help you improve your habits. Develop better habits: Set targets for the things you want to spend more time doing. Schedule: Set specific times and dates or weekly schedules to make your goals more achievable. Habit score: See how you’re doing with individual habits or overall with your habit score. 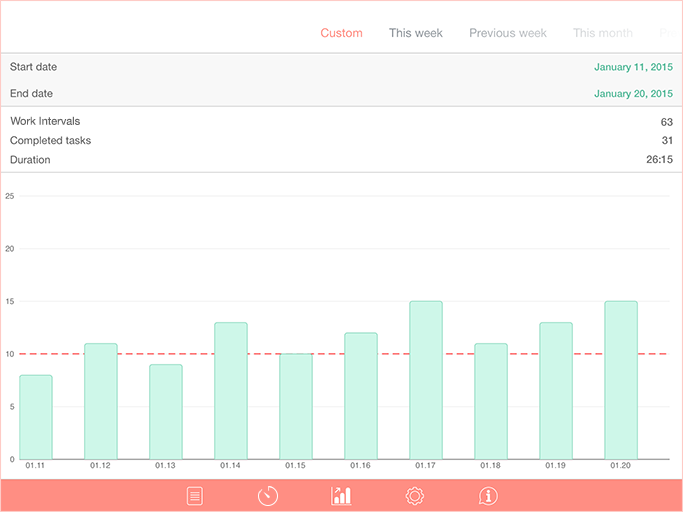 Reporting: Detailed graphs and statistics to keep track of your habits and monitor performance over time. Reminders: Set reminders to keep you in check in moments of weakness. With productivity apps, there’s a lot of focus on the things you shouldn’t be doing but Loop takes the opposite approach and puts the focus on what you could be doing better. Forest is easily the quirkiest productivity app in our list today. It’s only available on iOS and Android but there’s beautiful irony in the fact it’s designed to stop you spending so much time on your phone and/or tablet. Forest essentially gamifies downtime away from your mobile devices. When you want to focus, you plant a “tree” and the more time you spend away from your phone/tablet, the more it grows. Spend enough time away from your phone and you can grow an entire forest. Best of all, you can earn virtual coins by staying focused on your tasks and use these to grow real-life trees through the Forest app. Productivity: Spend less time your on your mobile devices and see the progress in the form of digital trees. Gamification: Forest adds a little bit of fun into the chase for better productivity. 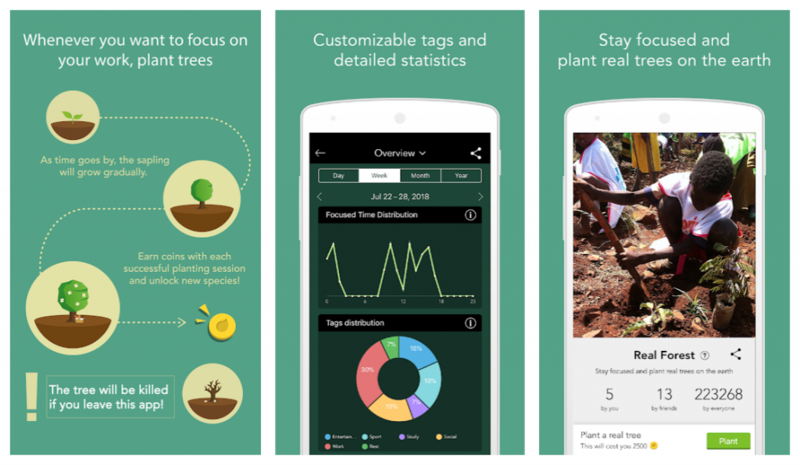 Grow actual trees: No other app in this list is going to help you plant actual real-life trees where they’re needed most. Forest not only injects a little bit of fun into productivity it also helps you make the world a better place while you’re improving your workflow. Todoist is a task management tool that promises to turn complex to-do lists into something easily manageable. In many ways, it;s like a Trello for individuals (and without the cards), helping you keep track of your own tasks and make sure nothing gets forgotten. You can create and organise tasks, set and change deadlines, prioritise tasks, set project goals and keep track of progress with the apps measurement and reporting features. Task management: A slick, feature-rich interface that makes it easy to create and manage tasks – no matter how long your to-do list may be. Prioritise tasks: Get the most important things done first by prioritising tasks. Project goals: Set project goals and make sure your on track throughout. 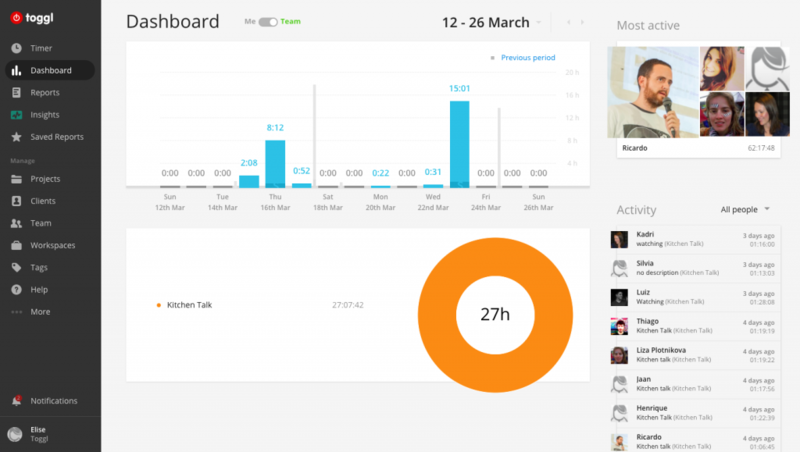 Reports: Keep track of your progress with Todoist’s measurement and reporting features. If you’re struggling to keep on top of your personal to-do list, Todoist offers a slick, cross-platform interface that makes it quick and easy to manage tasks. 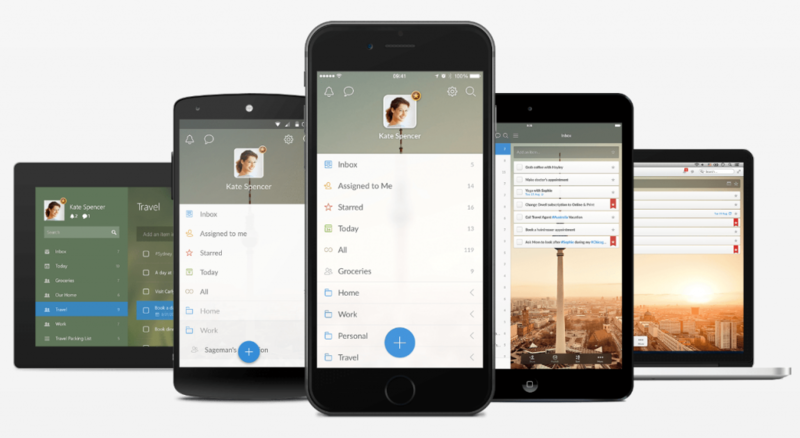 Wunderlist is a task management app with all kinds of advanced features. While Trello is designed for teams and Todoist is designed for individuals, Wunderlist is designed for both and it feels very much like a Trello alternative designed around to-do lists, rather than cards. Instead of cards, you create lists and group them into folders, which every member of your team (if you have one) can access and edit accordingly. To-do lists: Create to-do lists for individuals or teams and group them into folders for larger tasks or projects. 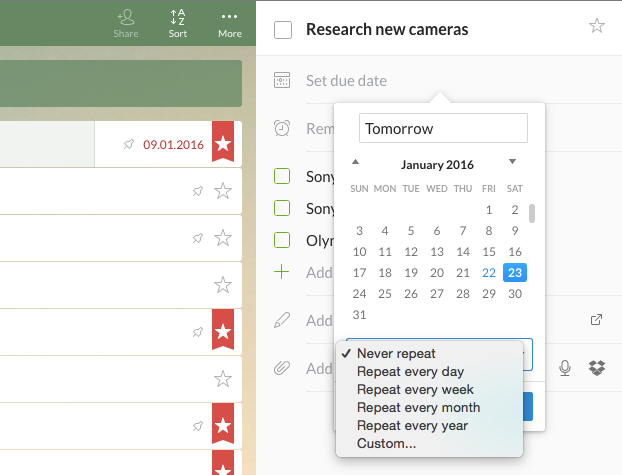 Task management: Set deadlines, assign tasks, set reminders and add comments or notes. Much like Trello, Wunderlist is a seriously powerful platform that offers a lot of productivity features for free or a relatively small subscription fee. See which one you prefer. 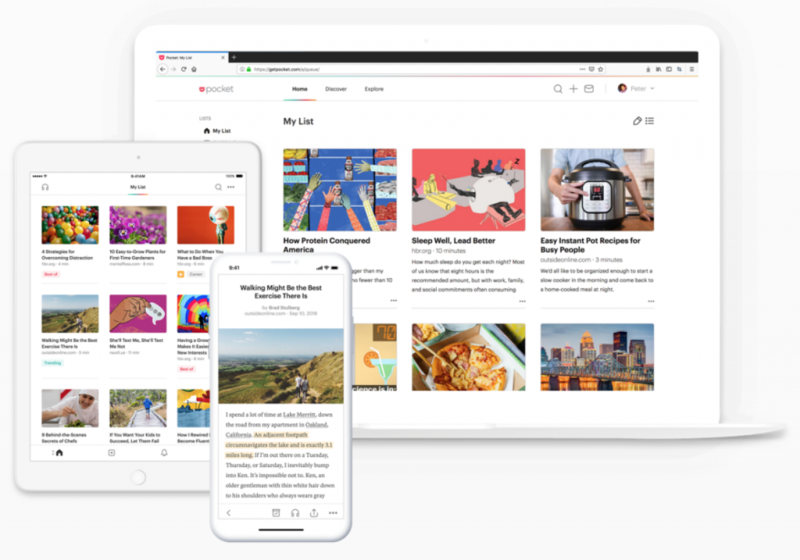 Pocket is a wonderfully simple productivity app that simply lets you save web pages for reading later. In truth, it’s little more than a bookmarking tool turned into an application but it really makes a difference to how you work. When you come across something interesting or useful, but you don’t have time to read it now, Pocket is there for you. Simply save the page (URL-based), assign a category if you want, and you’ll build a collection of resources in your Pocket account. The app essentially turns into a feed of things you actually want/need to read, learn or use for later. Save for later: Save web pages for reading when you have time or need them. Pocket may only have one feature but its one of the few productivity app I use every day and it costs me absolutely nothing. As you can see, all of the productivity apps we’ve looked at in this article vary greatly. While some of them have similarities, they all of have more differences than things in common. One the one hand, this is a good thing because we all have different needs when it comes to being productive. Best apps for productivity features: We compare the productivity features of each app to help you get a better idea of what each one has to offer. Best apps for cross-platformability: Check the apps you like the look of are available on the devices, systems and platforms you use. Best apps for user experience: Poor user experiences make for poor productivity – so we compare the usability of each app. Best value for money: We calculate the value for money of each app by comparing features vs price. Best apps for teams: We look at the best productivity apps for teams that need to collaborate seamlessly. This will hopefully tell you which combination of apps are going to help you get more done. First, let’s take a look at the key features each app has to offer so you can get a clearer idea of what they do/don’t have to offer. Of course, there are some features unique to certain apps, such as Serene’s web and app blocking, and Pocket’s web page saving (pretty much it only feature), but this gives you a general overview of how these apps compare. Some are more centred around timing your activity and help you waste less time while others are more geared towards project and task management. It’s also worth taking a look at the integrations available with each app because you can combine Trello with Toggl to add time tracking to your project management tool, for example. Next up, let’s take a look at which platforms each of these apps are available on. In an ideal world, you want any productivity app to be accessible on every device you use – even if this means using a web app on certain devices. The good news is most of these apps are available across Windows, Mac, iOS and Android while half of them also have a web app, giving you browser access on any device. Productivity tools are supposed to remove distractions and help you get more done – not make life more difficult for you. This means usability is paramount and, while all of the apps in this list offer solid user experiences, there are a few that still stand out. I’ll take a closer look at each of these in a moment but, first, I’ll explain what I’ve based this decision on – because user experience is a subjective thing. Now that you what I’ve been looking for in each of these apps, let’s take a look at our top three and explain why they win the usability test. I can honestly say Toggl is one of the most pleasant app experiences I’ve ever had and I put a lot this down to the fact it revolves around a fairly simple function: timing how long it takes you to get tasks done. There are a lot other features available with Toggl but everything centres around this single concept and this is reflected in the app’s architecture, navigation and overall experience. Its clean interface keeps every feature within reach and makes it easy to get around – very much like an improved version of the WordPress interface. This experience is consistent across the Toggl desktop, mobile and web apps, so you really can move between them seamlessly. 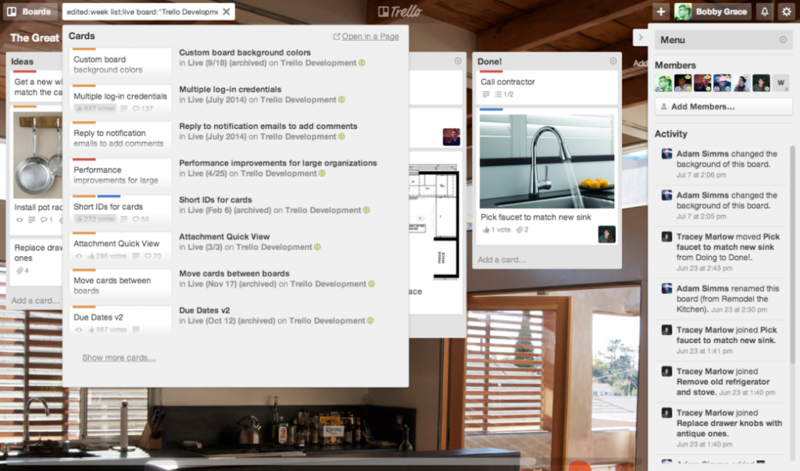 Trello isn’t quite as lean and clean as the Toggl user experience but it’s a far more complex application. When you consider everything Trello simplifies for collaborative teams, it’s an impressive example of software design and development. The main dashboard (above) is where you can manage your profile, project boards, team members and account settings. Admittedly, the card-style project boards look a little cluttered when you first see them but it takes no time at all to get over this. Trello makes it incredibly easy for collaborative teams to work on projects and make sure everything gets done. Adding new tasks, changing deadlines, reassigning tasks, discussing them with your team members and so much more can all be done in real-time from the same place. Wunderlist takes the classic to-do list concept and turns it into a feature-rich productivity app for individuals and teams. As you add new tasks to your lists you can assign them to specific dates, define the duration, set them to repeat, create reminders and organise your tasks. If you’ve ever used Google Calendar to try and arrange your schedule, you get the same kind of control over creating repeat tasks. You also get a much better interface to work with and more freedom to view your to-do lists or check tasks by date, week or month. It’s much easier to manage, reschedule mark tasks as completed. Again, value is a subjective thing so what we’re going to do here is give each app a score out of ten for three categories: cross-platformability, features and then the cost. Free apps instantly get 10/10 score for cost while small one-off payments will get 9/10. Monthly costs are then rated down from 8/10 based on the monthly cost. Keep in mind, I’m listing the maximum price for these apps and most of them offer a free version and/or cheaper options. I’m going with the most expensive prices purely because they give you the best of each app’s features. I’ve marked prices with an asterisk where free or cheaper options are available. The free apps that score well in cross-platformability are always going to get high scores here. An app like Pocket may only have one real feature but it’s a wonderfully designed app that you can use on every device and it costs you nothing to use. In truth, all of these apps are good value for money and the more expensive options give you a lot of features for your money. Besides that, there are free and/or cheaper packages available with most of them and even the free versions of Toggl, Trello and Wunderlist are powerul tools – so be sure to check them out. While all of the apps in this list are excellent productivity tools in their own right, they’re not all designed for teams that need to collaborate more effectively. Trello: For helping teams work on complex or long-term projects. Wunderlist or Todoist: For managing tasks and schedules. Toggl or RescueTime: For measuring productivity and reducing distractions. 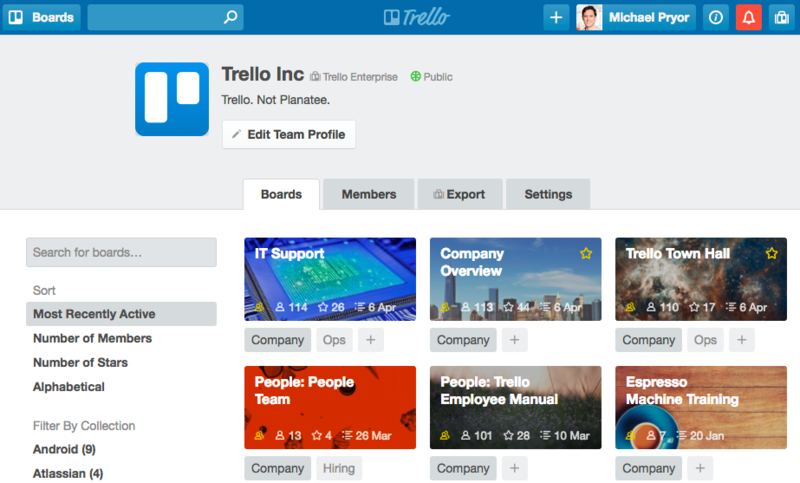 If you need a platform that helps teams collaborate on projects, Trello is the app for you. Every task is assigned to the relevant person, team members can work together or individually as needed and progress is updated in real-time – so no tasks are missed. Projects can be a complex thing where requirements, workloads, new challenges and solutions can change at any time. Trello makes the unpredictable nature of team projects easier to manage. A great feature of Trello is that you can invite unlimited people to your projects and they can access the app from anywhere. Which is ideal if you have a mix of in-house and location-independent team members. 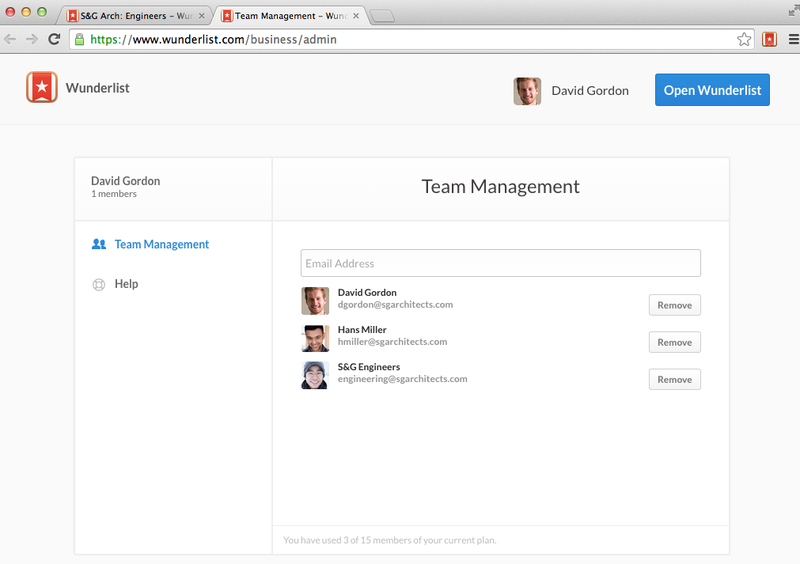 While Trello is truly designed with teams in mind, Wunderlist and Todoist can be used by teams or individuals. The difference is these aren’t project management apps and they don’t have a great deal to offer when it comes to collaboration either. This is fine because a lot of businesses don’t work on projects and tasks are often self-contained. When your system needs updating, you just want it done and if a report is due, you simply want to assign it to the right person and know it’ll be ready in time. Wunderlist and Todoist are exceptionally good at managing these kinds of working environments, where tasks are self-contained or teams largely work individually or in smaller groups. Toggl and RescueTime are neither project or task management tools. Instead, they track and time members as they work to help you understand how much time is really being spent on individual tasks. In the case of Toggl, the idea is to make sure you’re hitting profit targets, It does this by timing tasks so you can see if they’re taking longer than expected – in which case, you can delve deeper into reports to determine whether you’ve underquoted or things aren’t getting done as quickly as they should be. RescueTime aims to do something a little different by tracking the amount of time people spend using specific apps and websites. This reveals how much time people are wasting on social media, news sites and other distractions, which is where you can use its app and website blocking feature to remove those distractions entirely. What’s holding your team back? All five of these apps can improve the productivity of your team but they all solve slightly different problems. So, first, you need to determine what’s holding your team back and then choose the right tool(s) to solve your problems. So that’s my pick of the best time management and productivity apps. I’m not suggesting you’ll find all the tools you’ll ever need in this article but I’m confident you’ll make a lot of progress by combining just a few of the options we’ve looked at today. Creating the most productive workflow for your tastes and needs is going to take the right combination of tools and you can either use or try all of these for free. Hopefully, I’ve helped you narrow down the list of options and figure out a little bit more about what you need/want from a productivity app. Now, it’s over to you to try out the apps you think have something to offer and find the toolkit that works for you.